With newcomers such as MOCA and the utterly transformed Uptown District, University Circle (UC) has exploded with new activity that has easily blended in amid funky Hessler Street, the towering puppets of Parade the Circle and the venerable cultural institutions lining Wade Oval. If you build it, they will come. So goes the saying and so it is for UC, a development that University Circle Inc. (UCI) and its partners have noted and then some. "I really think transportation is on a lot of people's minds lately. It's certainly on our minds here in University Circle and the surrounding area," says Laura Kleinman, UCI's vice president of services. "Such substantial growth means a greater volume of people in the area," she adds, noting that the influx increases pressure on the environment, the infrastructure and most importantly, the people. To ease it all, UCI, along with some 20 area partners, has developed the expansive Moving Greater University Circle's Transportation and Mobility Plan. At more than 140 pages, the document is daunting, but it's implementation and intent are already evidenced in the UC area in the friendliest of ways, starting most notably with a familiar link that's just expanded and aims to make navigating the area easier than ever. The free CircleLink shuttle has historically catered to the area's education and medical industries. A new yearlong pilot program, however, will expand coverage to the Little Italy neighborhood, complete with a new vehicle. "We added a smaller bus so it could navigate Little Italy more easily," says Kleinman, noting that the tiny enclave isn't conducive to maneuvering large vehicles. The new BlueLink, which launched today, will operate from 10 a.m. to 6 p.m. Monday through Friday and noon to 6 p.m. on Saturday and Sunday. 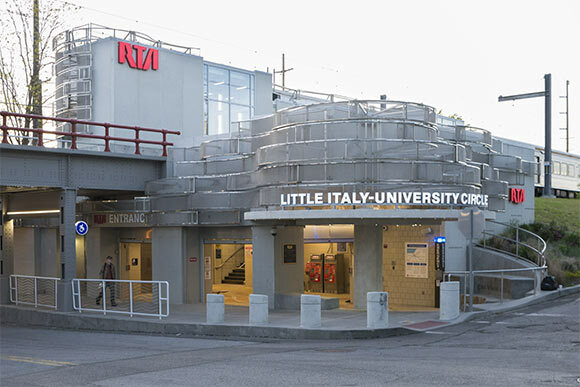 The free shuttle will circulate every 20 or 30 minutes and will stop at the new Little Italy – University Circle RTA Station; points along Mayfield, Murray Hill and Cornell Roads; and the cultural attractions lining Wade Oval and Magnolia Drive. The addition increases the small but mighty CircleLink fleet from two to three shuttles. The newly named GreenLink will follow a route similar to that of the former shuttle service, with stops along Adelbert, Juniper and Bellflower Roads, as well as East 115 Street. Both routes will help promote the "park-once" concept, by which UC advocates encourage visitors to park in one spot and visit the Circle's amenities throughout the day without moving their car. It will also encourage visitors to enjoy the new CircleWalk program, with it's 40 inviting 'Story Poles' that now pepper the area and draw attention to points of interest such as Rockefeller Park and the Commodore Hotel. Others who initially travel to the area via RTA's Healthline or the recently improved Cedar – University Rapid or the Little Italy stations may opt for two wheels and partake in the forthcoming bike share program. Initially announced last year, University Hospitals was tapped as title sponsor of the citywide UHBikes program last month. The program will be rolling out over the coming weeks. The University Circle area is slated for 10 stations that will house approximately 50 bikes to let. "We're encouraging people to use public transportation get to the Circle and either walk or hop on CircleLink to take them anywhere else in Circle," says Kleinman. 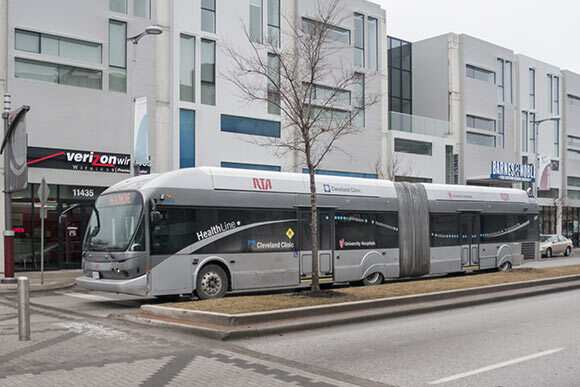 "We're working closely with RTA to promote that." To that end, Joe Calabrese, RTA's CEO and general manager, will deliver the keynote at the 2016 Uptown Business Association Showcase in the Circle on Thursday, June 16 from 8 to 10 a.m. at the Cleveland Museum of Natural History. With all this talk of how people can get around the Circle, Kleinman sees Calabrese as a perfect fit for the event. "I think Joe is a super champion of public transit in the region and even around the country," she says. "I know he's excited about the investments that they have made recently in University Circle, particularly with the two Rapid stations. He's just a great supporter and believer in public transportation and the benefits it can have on infrastructure, on our communities, on our health and on the economics in the region." Calabrese will talk about the Moving Greater University Circle Plan, its components and how RTA has been involved in it all. He'll also discuss RTA's Transit Benefits Fare Program, by which employers can save up to 7.65 percent on average in payroll tax and employees can save up to 40 percent on commuting costs. "People need to be able to get to their jobs easily and cost effectively," says Kleinman, adding that she believes attendees – employees and employers alike – will appreciate hearing about the program. Also last year, the Stephanie Tubbs Jones Neighborhood Leadership Award, which honors the late Congresswoman Stephanie Tubbs Jones and her legacy of service to the University Circle community, was given to Sara Mierke, Hawken School, and Sally and Bob Gries, The Gries Center. "The [UBA] seeks to engage not only business owners from the Circle, but from the surrounding neighborhoods to help them network with one another and raise awareness of the local business community," says Kleinman, adding that this is the fourth year the Showcase event will include awards. "We'll be celebrating local businesses," she says of the forthcoming event. "We'll also be connecting with a really important topic: public transportation." Citizens Bank is the presenting sponsor for the 2016 Uptown Business Association Showcase in the Circle event, with additional promotional support from the Council of Small Enterprise (COSE). The George Gund Foundation and the Northeast Ohio Areawide Coordinating Agency's (NOACA) Transportation for Livable Communities Initiative funded the Moving Greater University Circle Plan. University Hospitals and Case Western Reserve University are funding the pilot BlueLink shuttle program. This article was made possible by a partnership with University Circle Inc.